NOTE: Applications close at midnight EST on Friday, December 1. New applicants should apply to the second workshop on Wednesday, January 10. Waitlisted December workshop applicants may opt to stay on the waitlist, OR have their application considered for the next workshop by emailing communications at datasociety dot net. 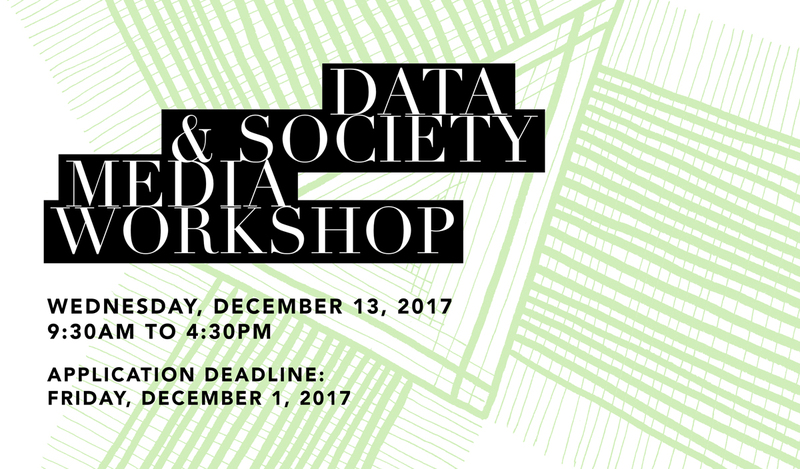 This immersive one-day, closed-door workshop directly engages journalists and media makers with Data & Society expert researchers. The program begins at 9:30am and closes at 4:30pm. Coffee, breakfast, and lunch are included, with frequent program breaks to enable calls and newsroom check-ins. The day closes with a lively food and drink reception with Data & Society (plus a special guest host, soon to be announced!). Data & Society is located in Flatiron/Chelsea district of New York City in walking distance from the C/E, 1, 4/6, and F/M trains. Limited travel stipends are available (see below). Select session titles include Gaming the Algorithm, Data as a Gift, and When Humans Attack. The program is intended as a one-day tour of the most complex hot topics on the horizon for mid-career to senior media professionals covering this field. The final program will be shared on Monday, November 27. Spots are limited and the process is competitive. Please apply ASAP. Applications close on Friday, December 1. Apply by filling out this form. We will respond with acceptances and waitlist notifications by Monday, December 4. If you have any questions, please email communications at datasociety dot net. We especially welcome applications from press professionals who identify as members of underrepresented groups. Note: A similar workshop in January 2018 will be announced shortly. Applicants on the waitlist for the December 13 workshop will be considered for this opportunity. Select travel stipends are available on a first-come needs basis to technology journalists residing outside of the New York City area, and for those with local transport accessibility needs. Please include such requests in your application form.